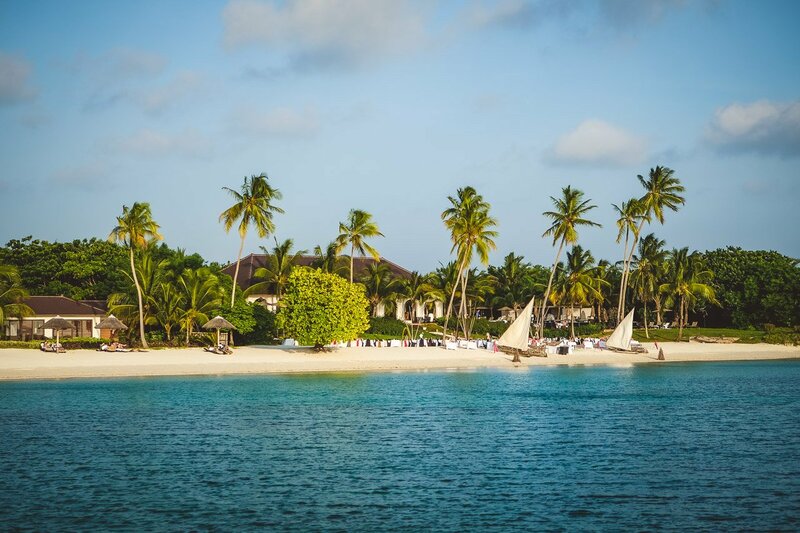 Zanzibar is a gorgeous island in East Africa, surrounded by the Indian Ocean, off the coast of Tanzania. 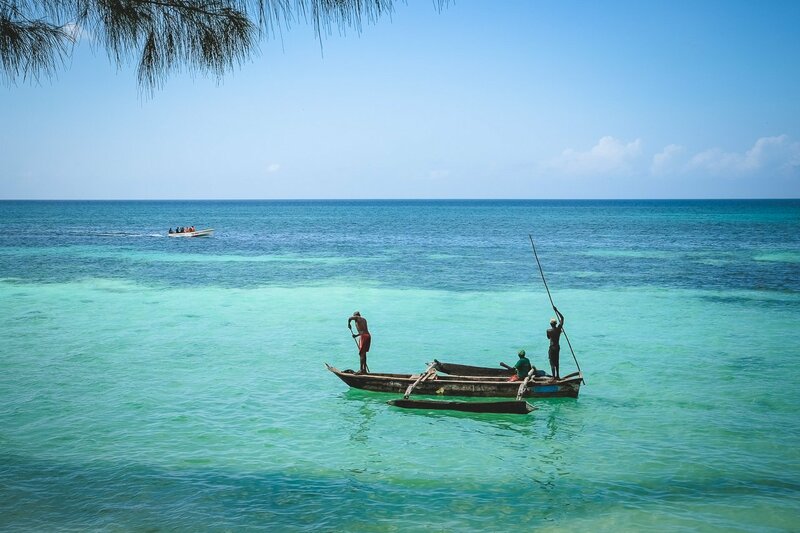 The natural surroundings are beautiful, and you encounter many wild animals like monkeys, bush babies, turtles, and dolphins. 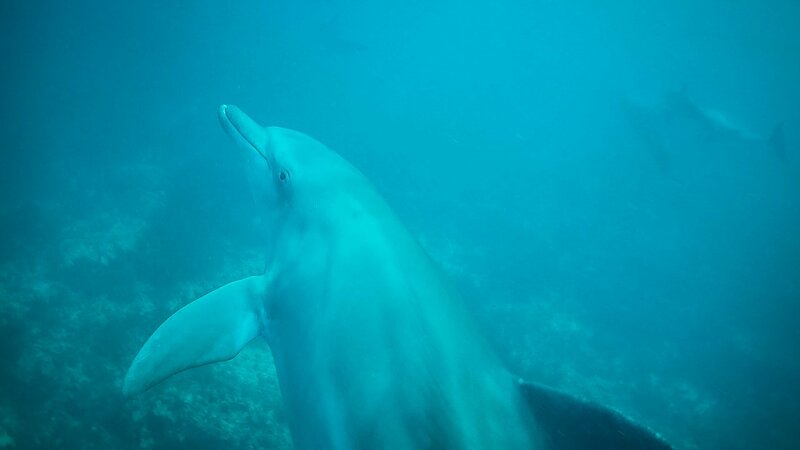 Dolphins are immensely fascinating beings, they have always captivated me. 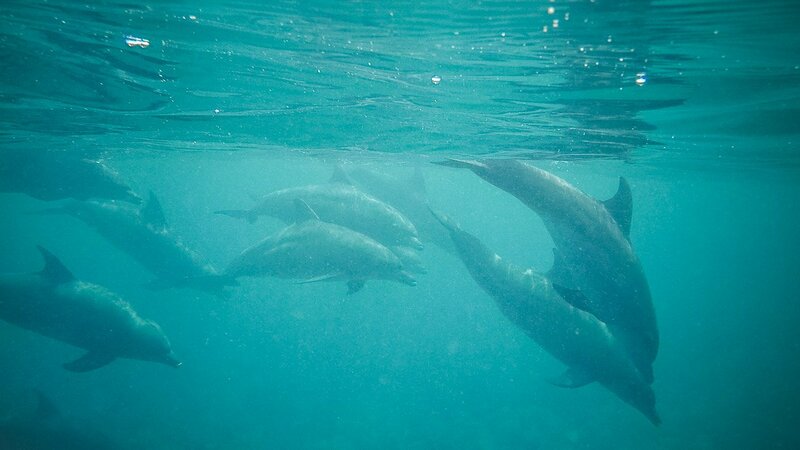 I have already had the privilege to swim with these majestic creatures in Mauritius and Kenya. There we were quite lucky to see them. 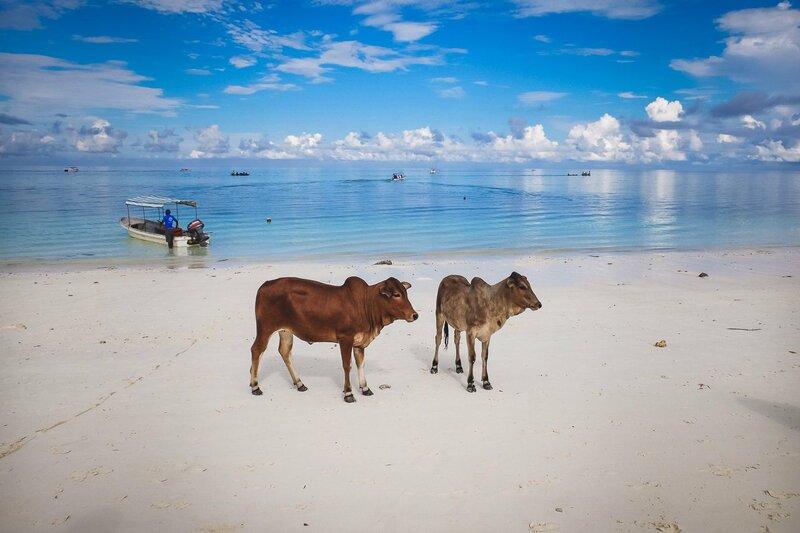 In Zanzibar, the chance of encountering them are much higher. 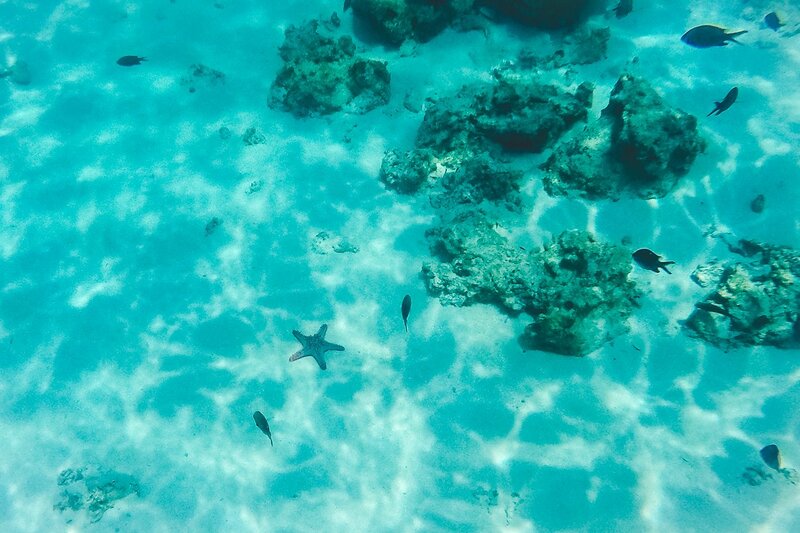 Even on the way back from a snorkeling trip, we saw some. This time, however, I could hear them, and I am convinced, call them! It was an unforgettable experience! 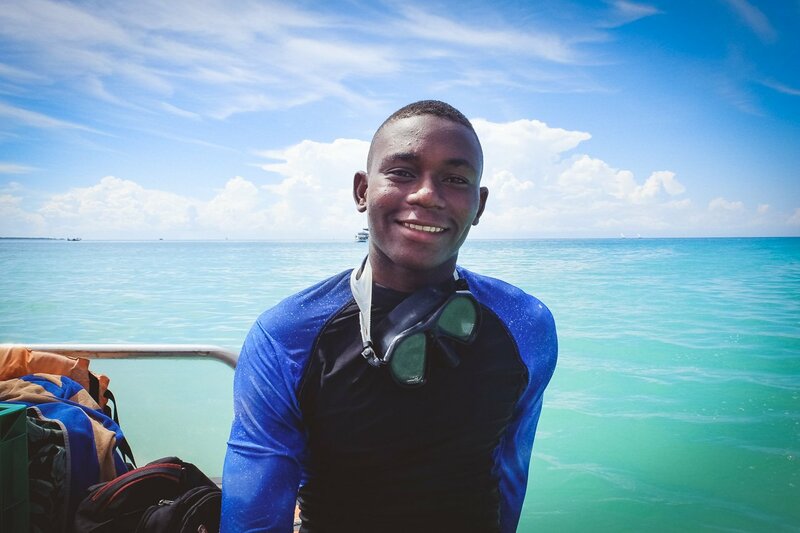 We went on a snorkeling trip from Zuri Zanzibar with East Africa Diving. 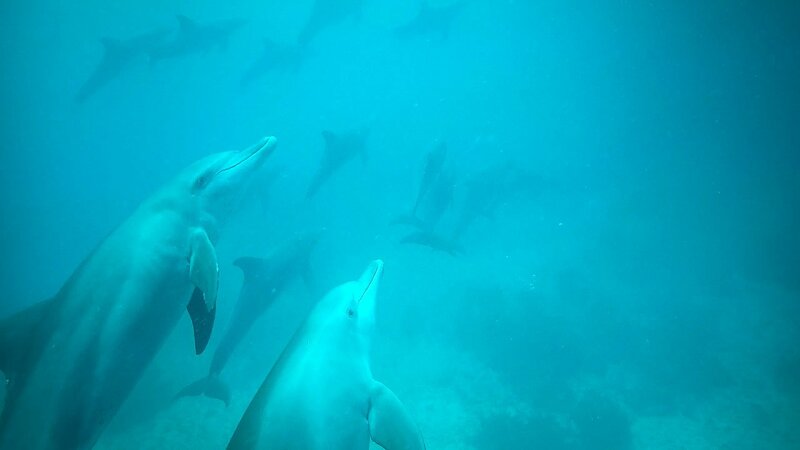 That we ended up swimming with dolphins, was an absolute coincidence. Usually, everybody goes to the south to see dolphins. 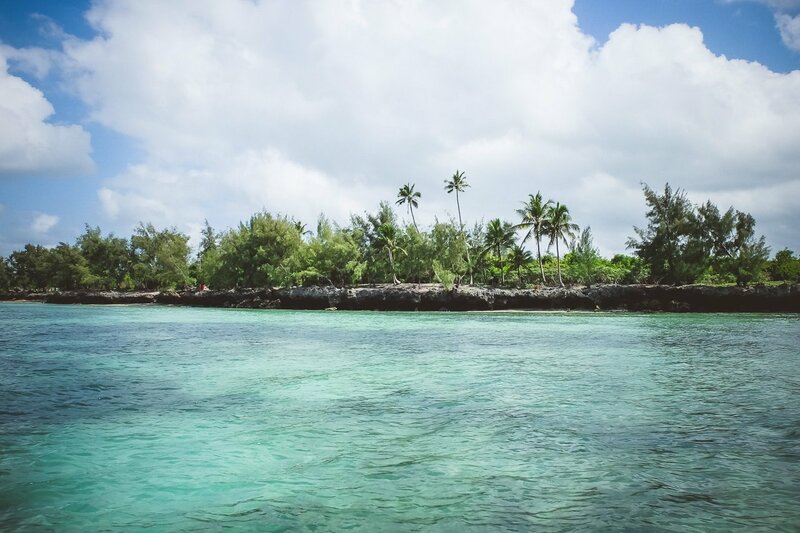 Our tour started in the north and went to the Mnemba Atoll. We were actually already on the way back when a few divers spotted the dolphins. I was so excited that I struggled to put my mask on and got into the water relatively late and the dolphins were already far off. The divers were lucky and got into the water much quicker. Thanks to the calm waters, I could hear their whistling crystal clear. So, everyone got back onto the boat, (it is not that easy to get on to a rubber duck) and followed the dolphins, but once again, they were much faster. I was adamant about seeing them! 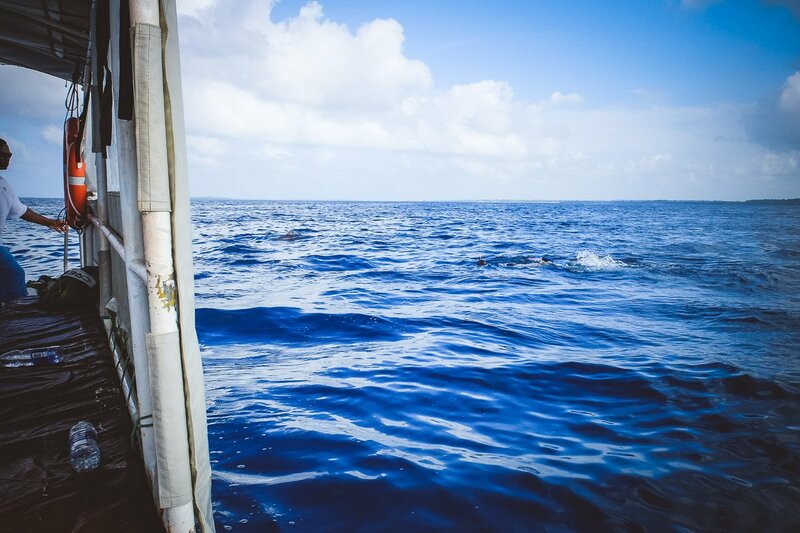 Everybody was making their way back onto the boat, but I stayed in the water, floating in the vast ocean. At a distance, I could see their fins. Luckily, it took some time for everybody to get onto the boat, so I had time on my side. 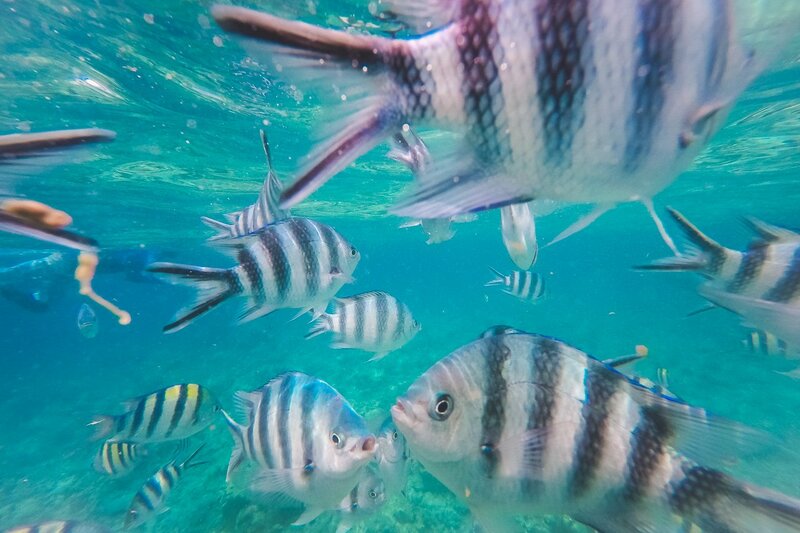 I tried to call them, as I have seen them do in the Maldives, by whistling. There I was, alone in the ocean, whistling and whistling, when suddenly their fins came closer into sight. They really came back. 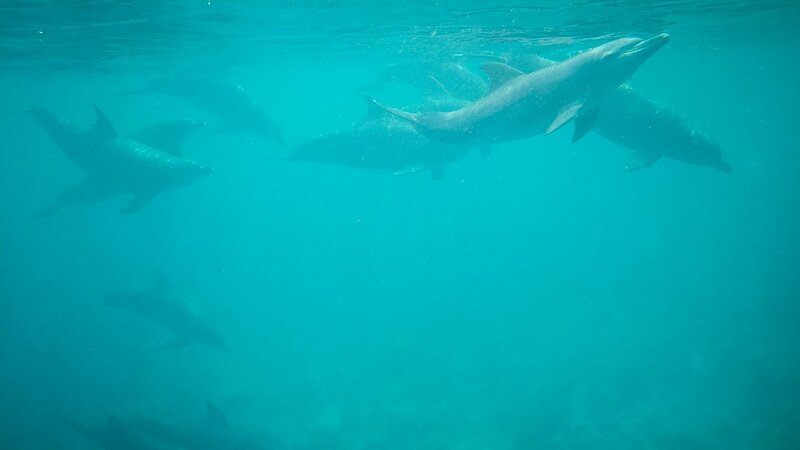 The whole school of dolphins, about 40 of them, came at me, and slowly swam around me! And they even made different sounds, almost as if they were purring. This was extraordinary! I will never forget these 25 seconds. 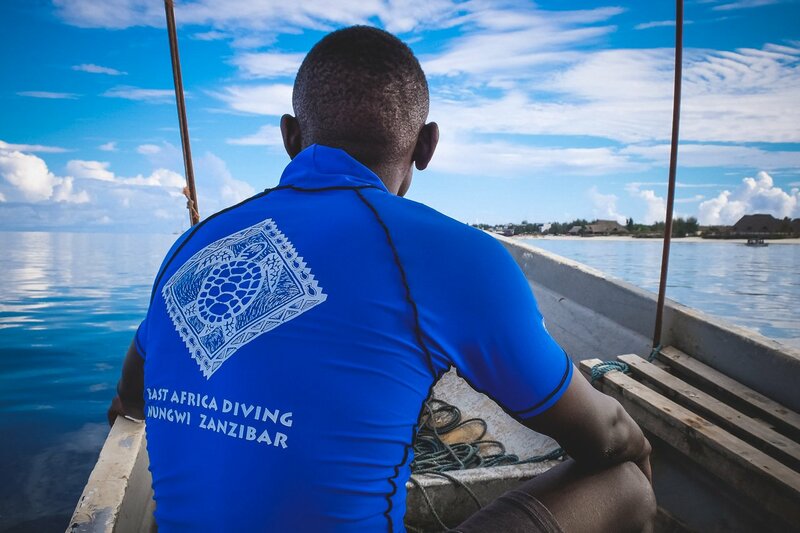 Ally picked us up by boat early in the morning from Zuri Zanzibar and dropped us off at the diving school. 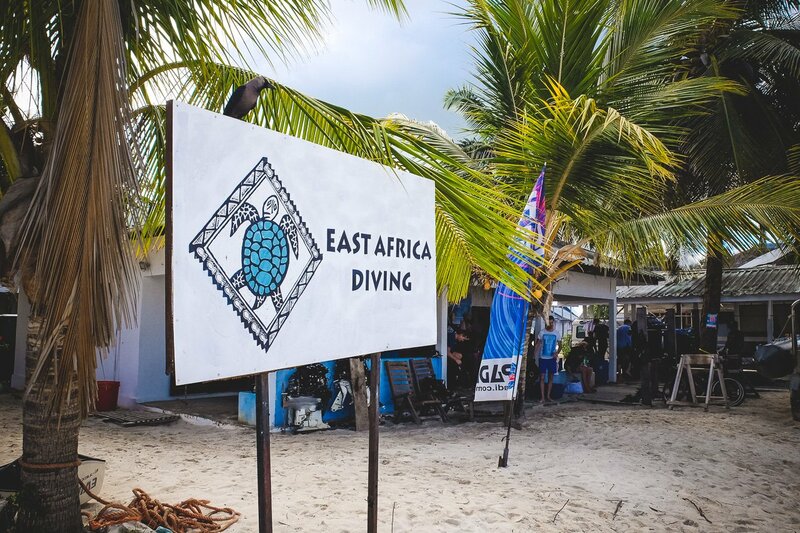 East Africa Diving is located on Nungwi beach in the north of Zanzibar and is led by the South African Delene. 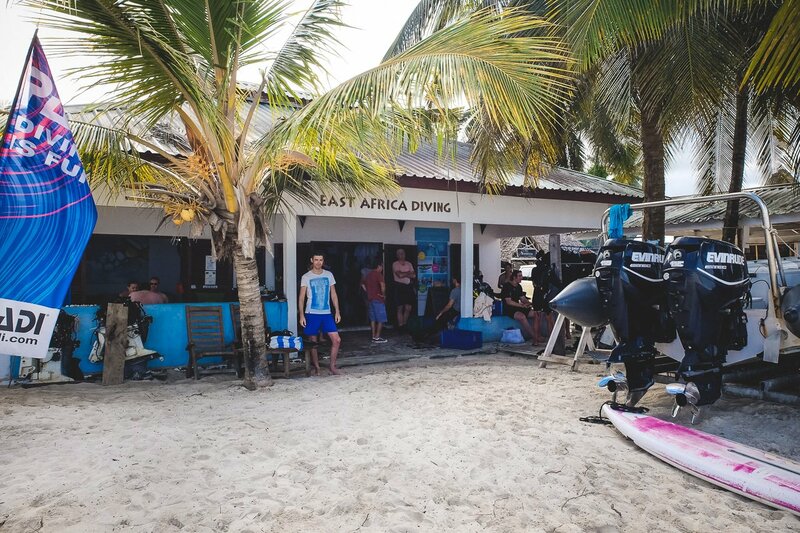 She is assisted by a great team of Zanzibar captains, International PADI instructors, and PADI divemasters. 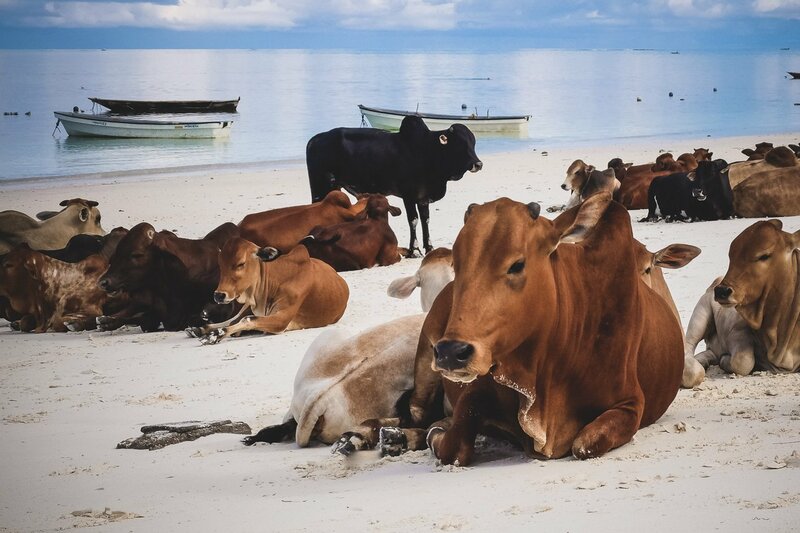 Wild cows obviously also feel very much at home on the beach. 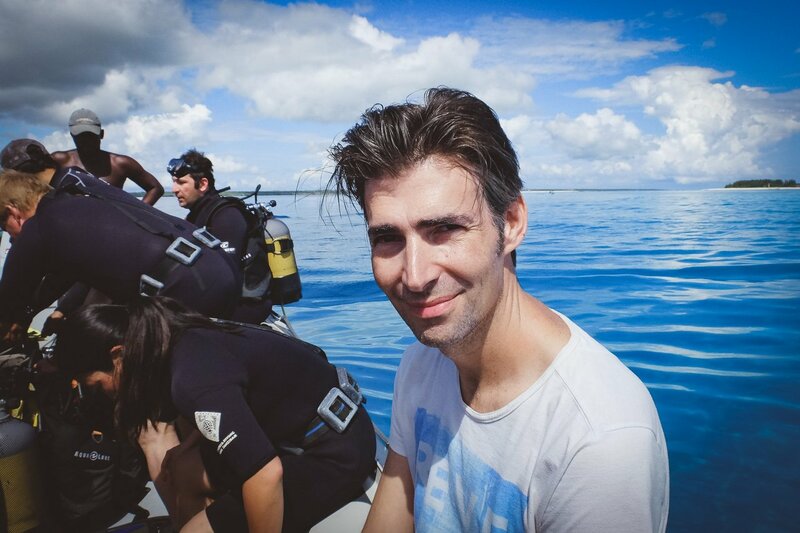 After putting on our diving and snorkeling gear, off, we went on the 8 meters long “Zodiac” out to sea in the direction of Mnemba Atoll. 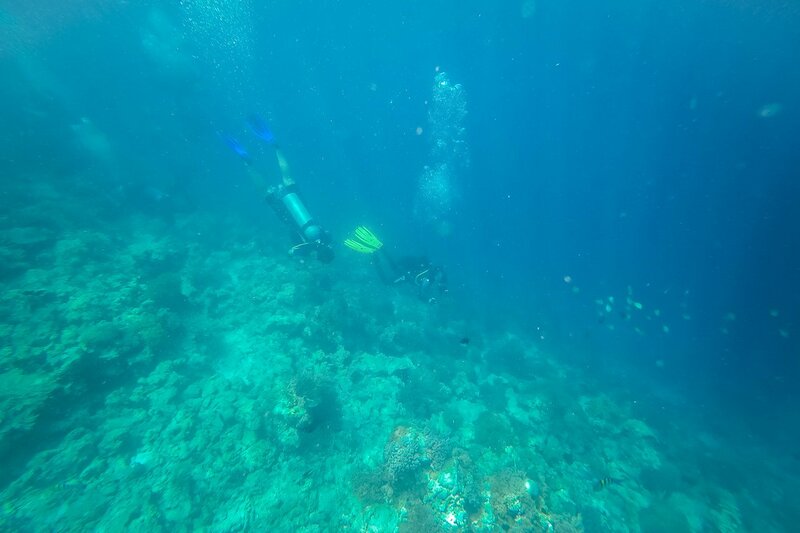 Divers have the chance to explore the coral reef to its full extent here. 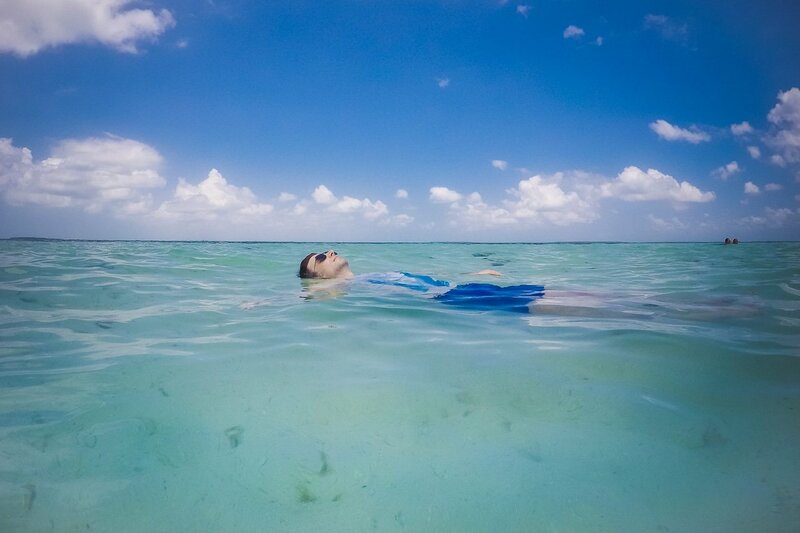 There is also plenty to see for snorkelers. Although we must say, we did find it better in the south. 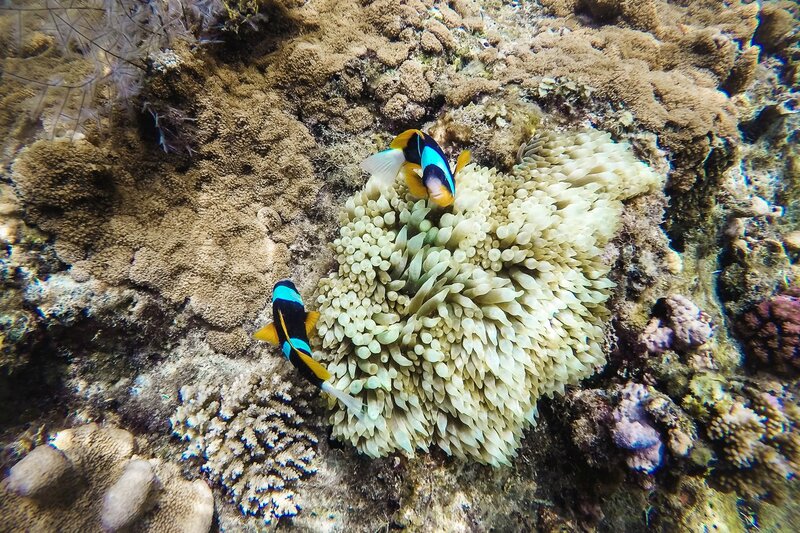 The coral reefs there are healthier and much more bustling with sea life. And then we were so lucky to encounter the dolphins on our way back. Ally said, that out of seven days he usually encounters them on five. So the probability of seeing some dolphins is quite high! 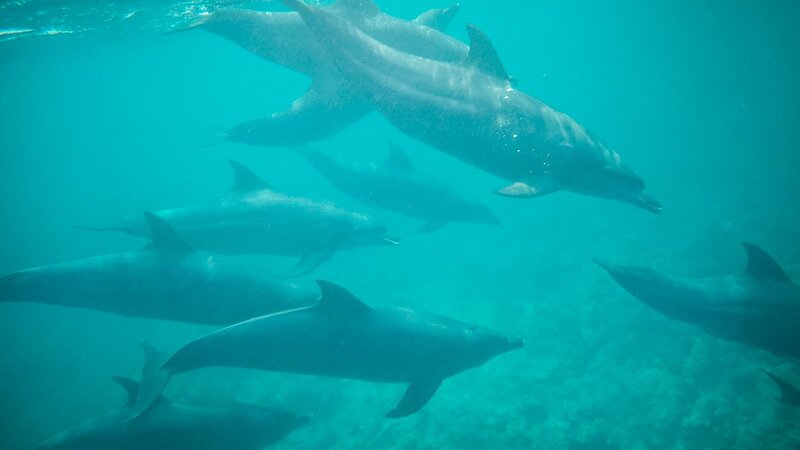 Most dolphins can be found around Kizimkazi, in the south of Zanzibar. As you have to leave quite early for the dolphin cruise, it is ideal to also stay in the area. 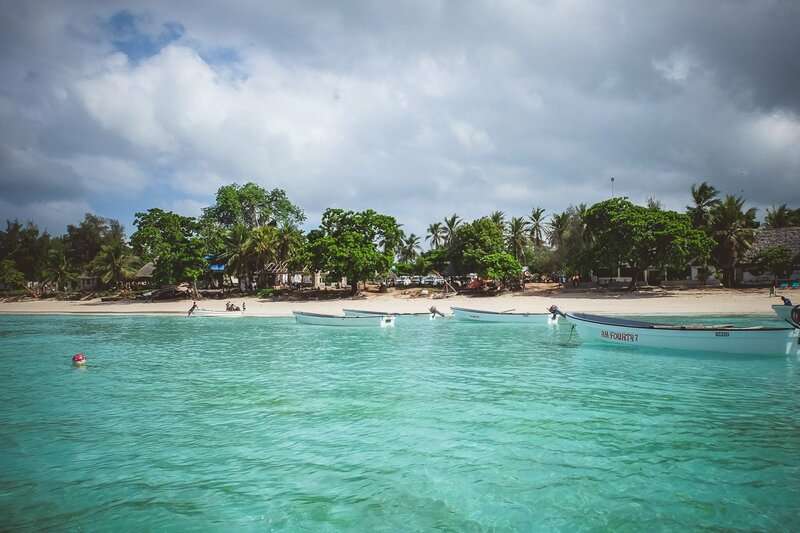 A perfect starting point for a Blue or water safari, and a dolphin cruise is the Eco Dolphin Safari Lodge. The accommodation is basic but cozy, and the prices are low! 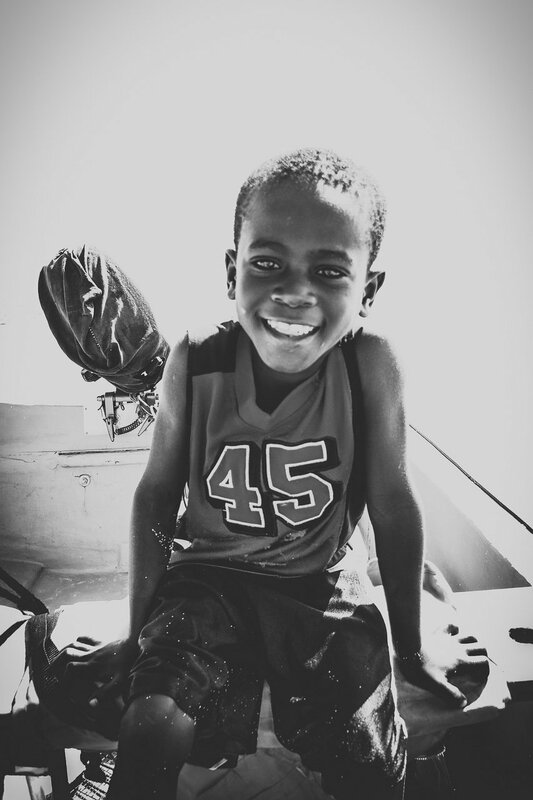 The locals pick you up early in the morning with a fishing boat. 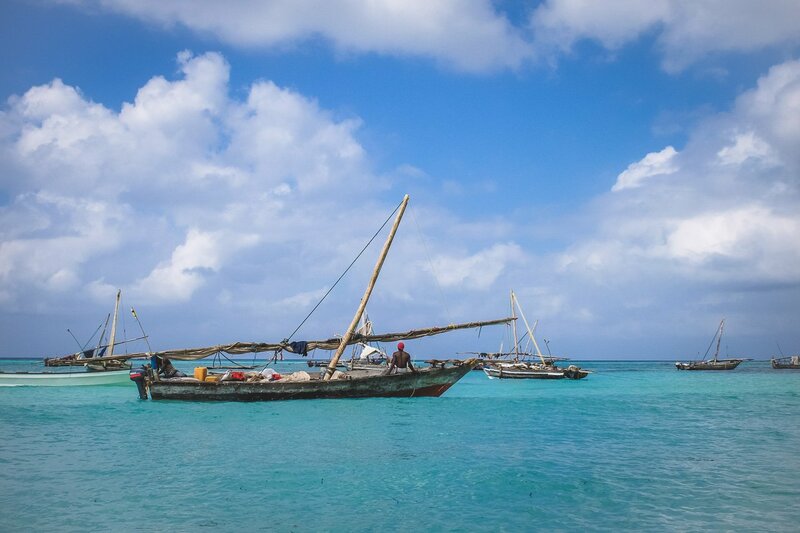 After a quick stop to collect the snorkeling gear at Kizimkazi fishing village, we made our way to Pungume Island, passing numerous fishing boats on our way. 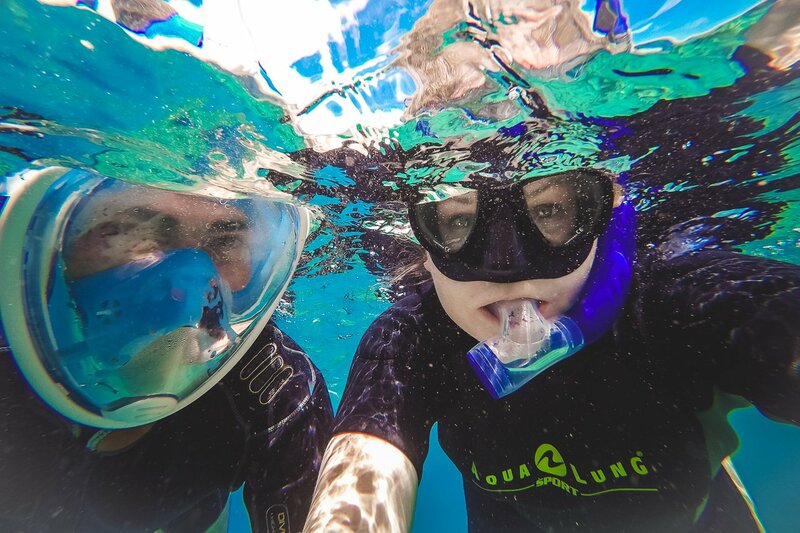 The snorkeling here is fantastic. 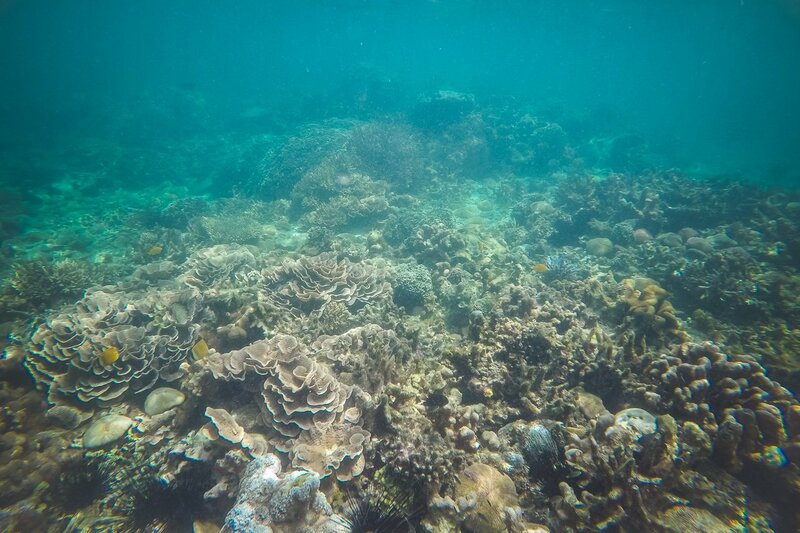 I have not seen such a well-preserved and colorful reef in a long time. 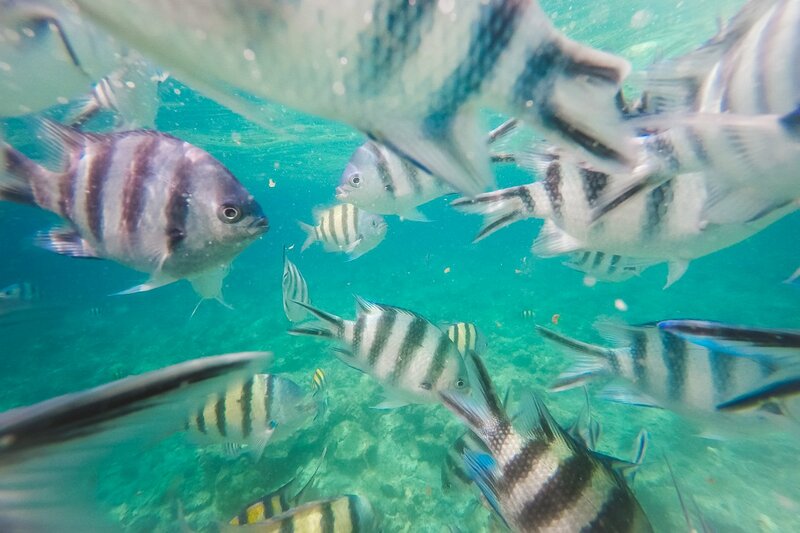 There is a myriad of fish in the pristine reef. 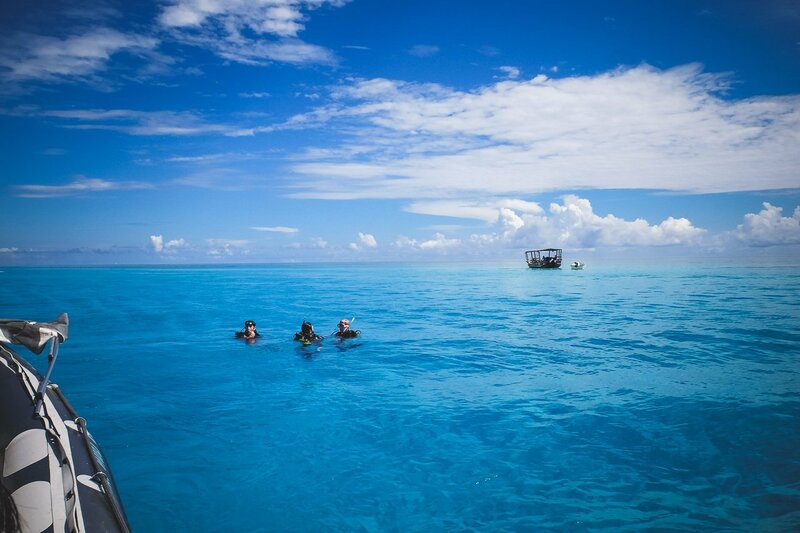 The perfect snorkeling spot! 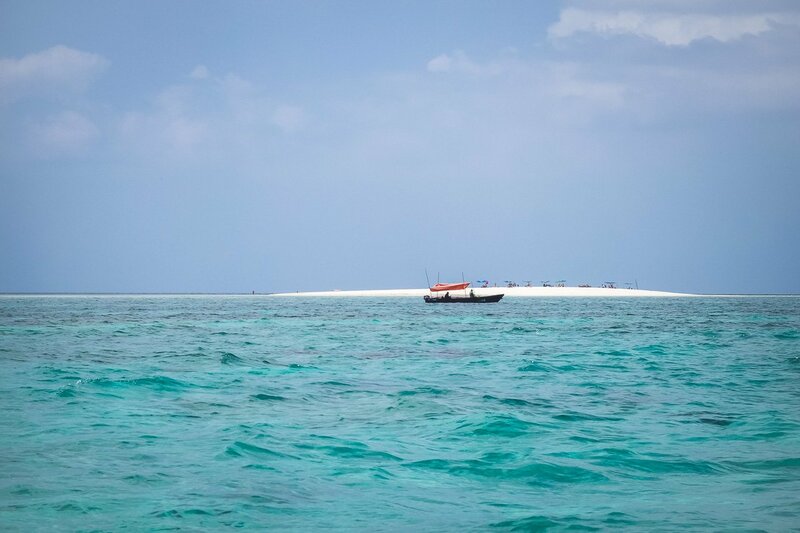 After about an hour to an hour and a half’s snorkeling, we went to a deserted sandbank. There we had some time for swimming and relaxation while the captains prepared a delicious BBQ. 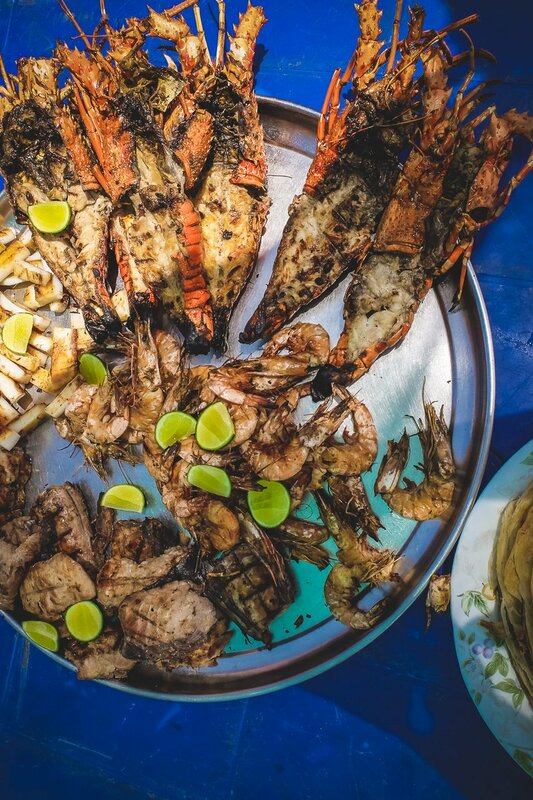 There were fresh fish, lobster, Chapati, an East African grilled bread, with homemade dip. Yummy! 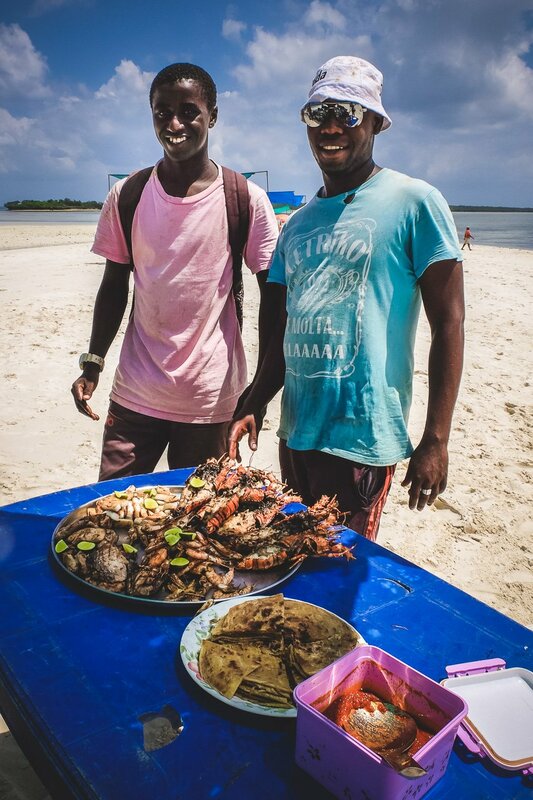 And honestly, it was the best lobster we had on our entire Zanzibar trip. Freshly grilled by the locals, it was the best by far! 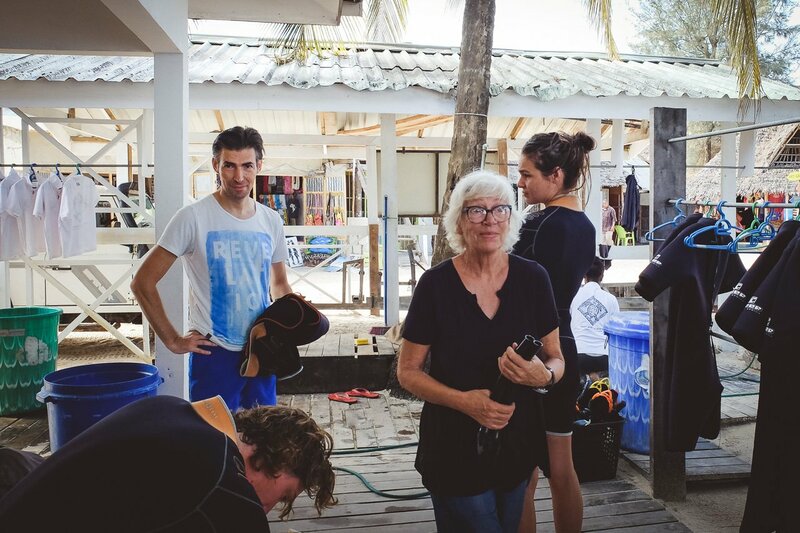 Our trip was organized by Astrid from the Dolphin Safari Lodge. But quite often one of the locals will walk along the beach and advertise these tours. These guys are really nice and will go the extra mile to make your trip a memorable one. And of course, they have the opportunity to make some money. In comparison to the offers at the hotel, you can get them at half price when booking directly with one of the locals. If you prefer to play it safe, booking through Astrid is reliable and good value for money. We had a great day with Rama and his team! Thank you so much! Actually, we planned a dolphin cruise with them for the next day, but the sun is quite harsh, and we were sunburnt after spending a whole day on the boat. So, we thought it best to take a break from the sun. Dolphin Safari Lodge has a pool, five bungalows and safari style tented accommodation, with basic bathrooms. 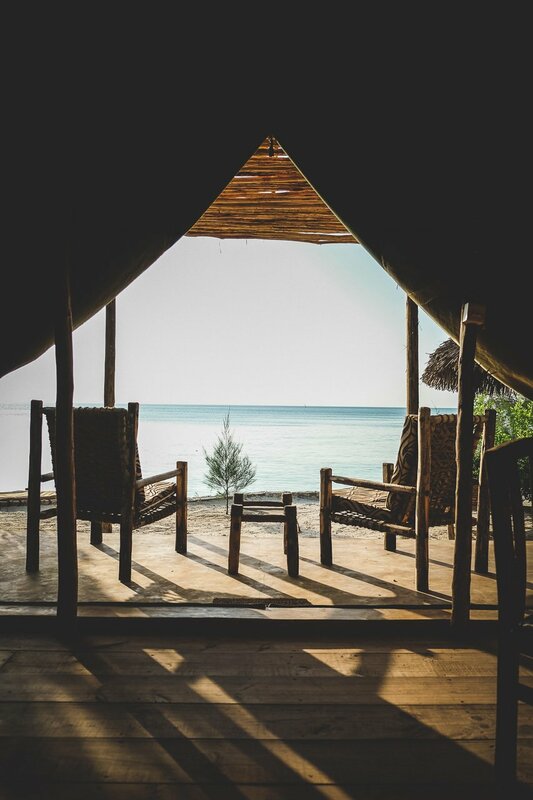 These tents have unbeatable ocean views. 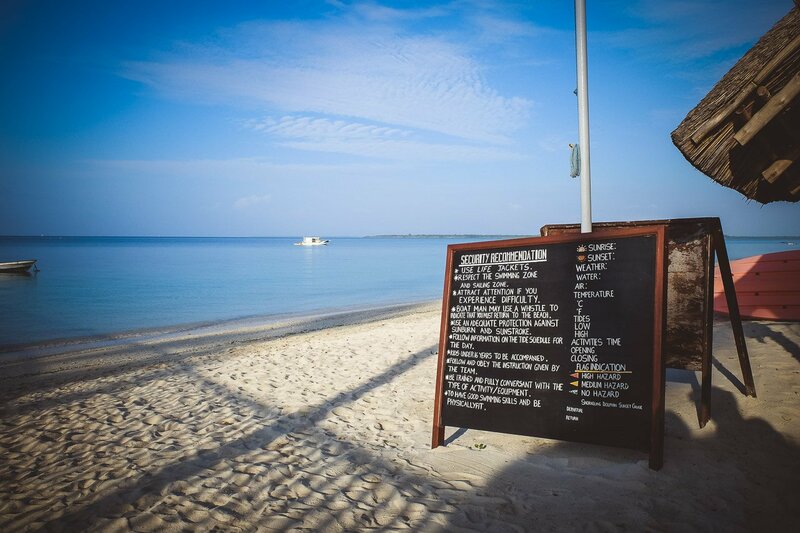 There are also five Bandas beautifully set in the natural surroundings close to the water. 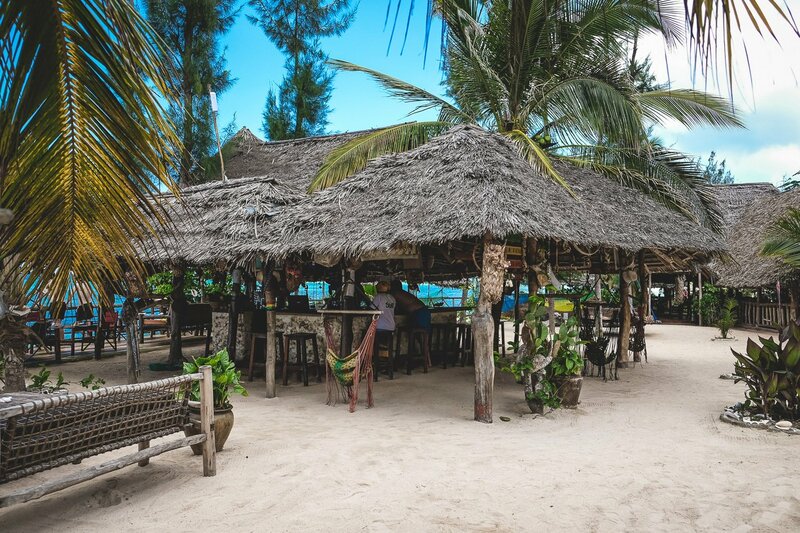 The location is absolutely fantastic, the local food is delicious, and the owners, their five dogs, and the Masai are lovely. 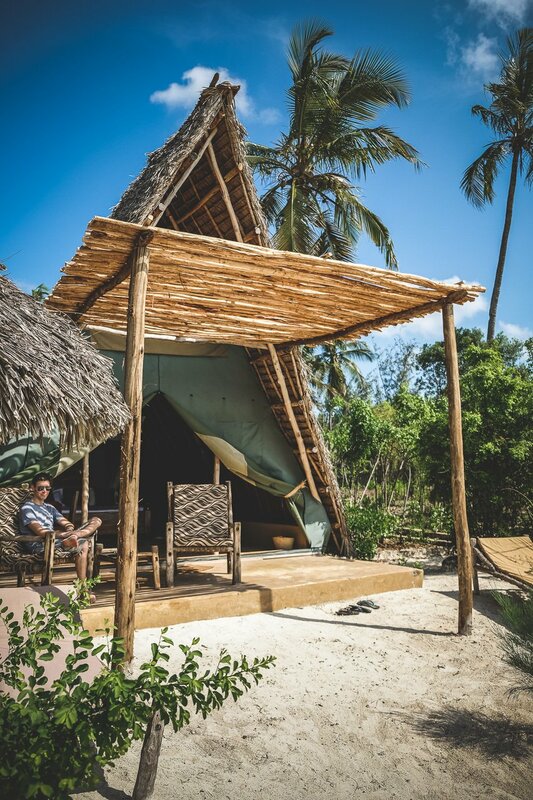 The prices at this simplistic eco-lodge are unbeatable! 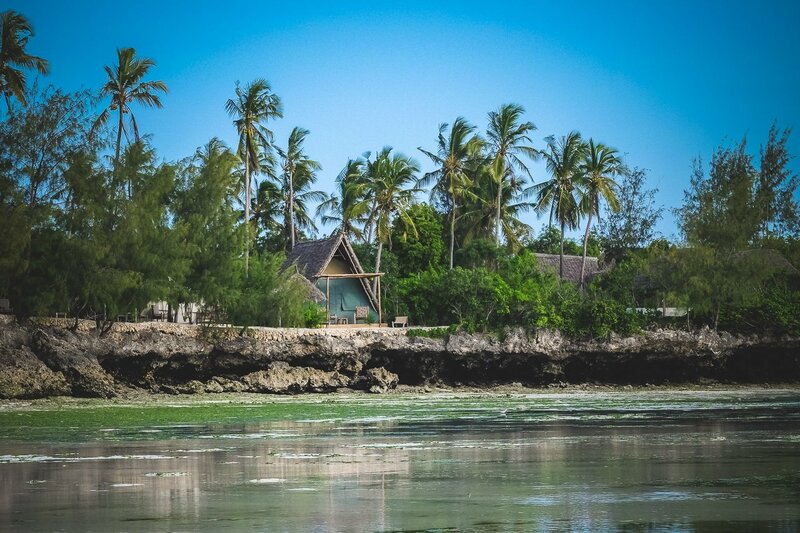 Directly adjacent to the Dolphin Safari Lodge is the Promised Land Lodge. We went for a walk through the lodge. It has a reggae feel, a pool, and 16 rooms. The garden is fantastic, the location is superb, and everything is well looked after. 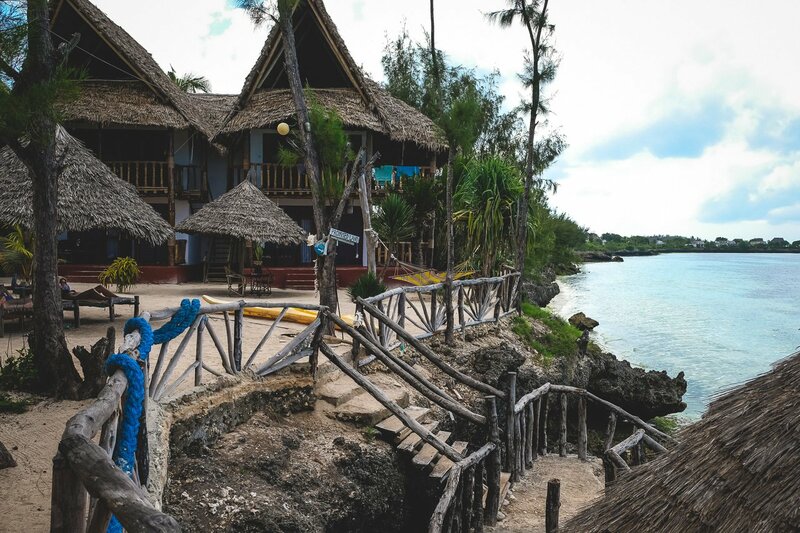 The Residence Zanzibar (Our Review >>) is also in the south of Zanzibar and an ideal location for dolphin cruises and snorkeling trips. 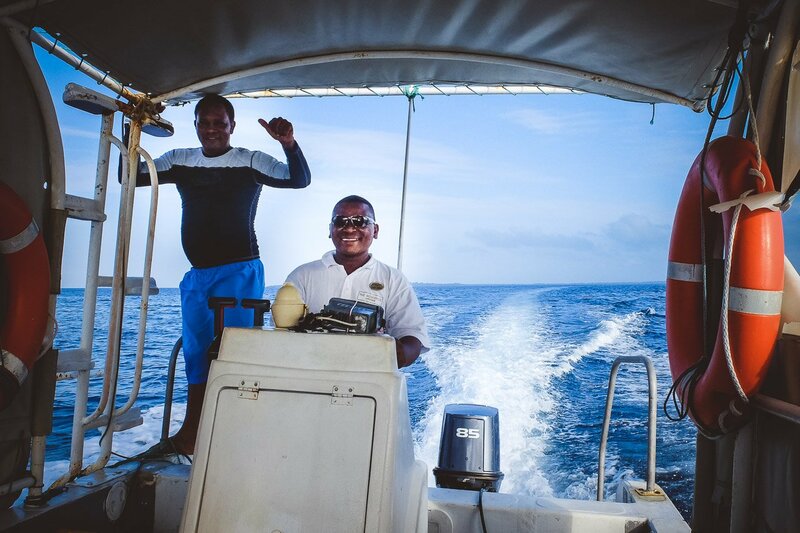 With a guide and a captain, we went out to sea early in the morning. Mostly, these tours start very early in the morning, but you also have the chance to see dolphins later during the day. Thanks to our excellent guides and also to the communication with other guides, we were once again lucky and also encountered dolphins on this trip. All of a sudden, they were there! Now, we just had to wait for the right moment to jump into the water. Dolphins are fast. But with lady luck on your side, they might swim right by you! Exhilarating! 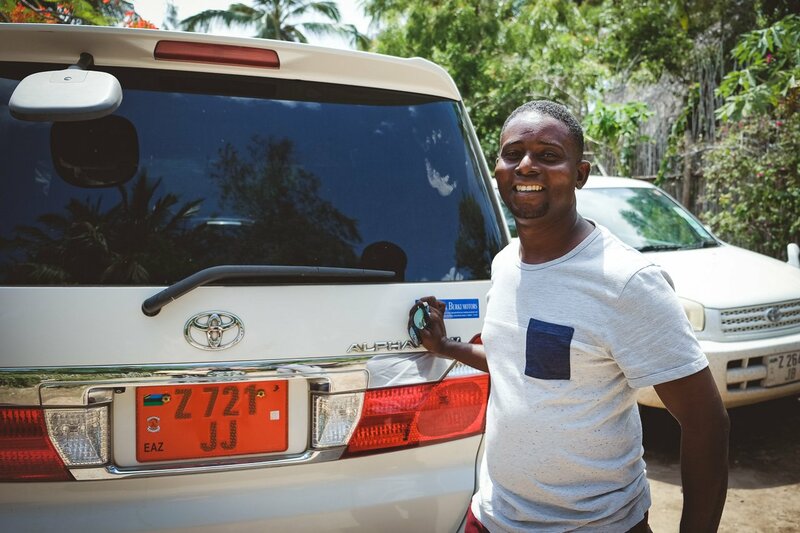 Transportation: To get from A to B on Zanzibar, we can highly recommend our driver Bamanga style! Very reliable and such a nice person! 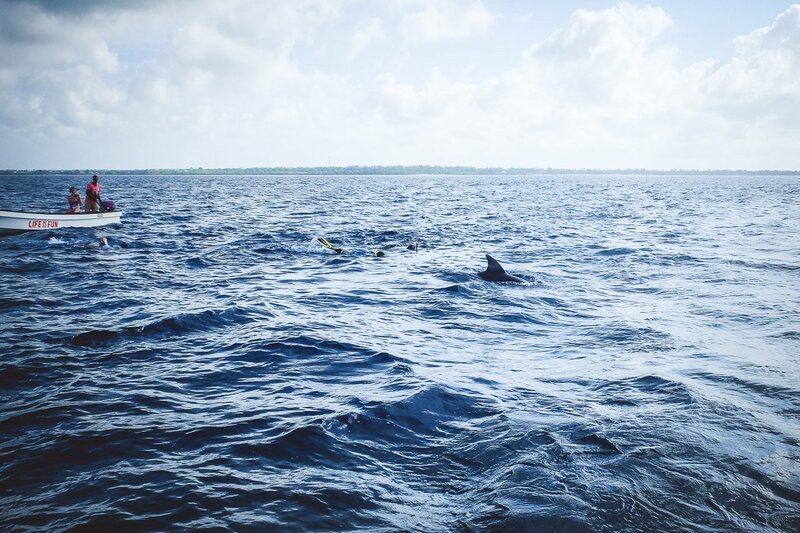 Note: Naturally, many tourists would like to swim with the dolphins because it is such a great experience. But too many boats are not a good thing. It is already a borderline scenario. The welfare of the animals and their natural habitat should be respected, as is the case in Mauritius. If you happen to come across dolphins by chance, it is even more spectacular, and of course, then you are alone with them. You really have to be lucky, but it can happen! Do you like this article, then make our day and share it! 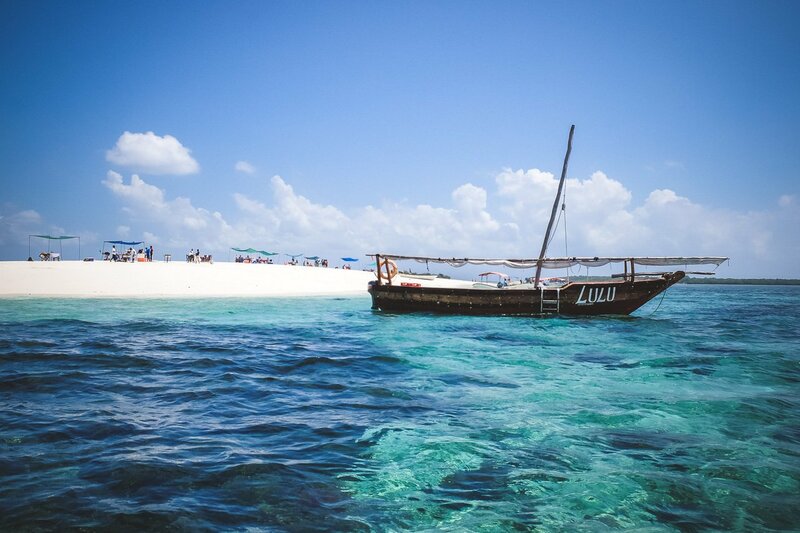 Please note: The Blue Safari with Locals and the trip with East Africa Diving, we financed ourselves. Our Dolphin Cruise at The Residence Zanzibar was sponsored. Thank you so much! Nevertheless, the opinions voiced in this article are 100% our own!